Jan/Feb 2011 In 2008 nearly 40,000 migrants entered Europe through Lampedusa, a tiny Italian island in the Mediterranean with a population of 6,000. During this period people migrating from all over Africa chose to enter Europe via Italian and Spanish islands in the Mediterranean, despite the deaths at sea of the thousands who had come before them. This is the damning verdict from Guisto Canatania, an Italian Member of the European Parliament, after a visit to Lampedusa in 2005. In the summer of 2008, Italy’s prime minister solved the problem through a wide ranging deal with Libya’s dictator Muammar al-Gaddafi. The so-called Friendship Treaty included a promise by Libya to stop asylum seekers and migrants getting to Italy. The Libyans were chillingly efficient. By 2009 Médecins Sans Frontières left Lampedusa because so few migrants were arriving and Human Rights Watch reported that the reception centre once bursting was now empty. The tourists of Lampedusa got their beaches back, no longer blemished by wretched Africans, but the suffering of the migrants did not end. Many of those caught by Libyan police trying to get to Europe were imprisoned or dumped in the desert where many died of thirst or hunger. Libya’s mistreatment of migrants and asylum seekers is well documented by the UNHCR and Human Rights Watch. When researching my project, I was told the notorious reception centre had been closed after riots and fire last summer, and that few immigrants made it to the island. If they did, they were shipped immediately to reception centres in Sicily. I decided to go anyway. I arrived in Lampedusa, about a week after Tunisia’s former president Zine El Abidine Ben Ali fled and so witnessed the first boats of Tunisians arriving on the island. I’d been sitting on some rocks idly waiting for sunset, after failing to illicit much reaction from locals about their once thriving migrant population, when I saw a tiny boat on the horizon. 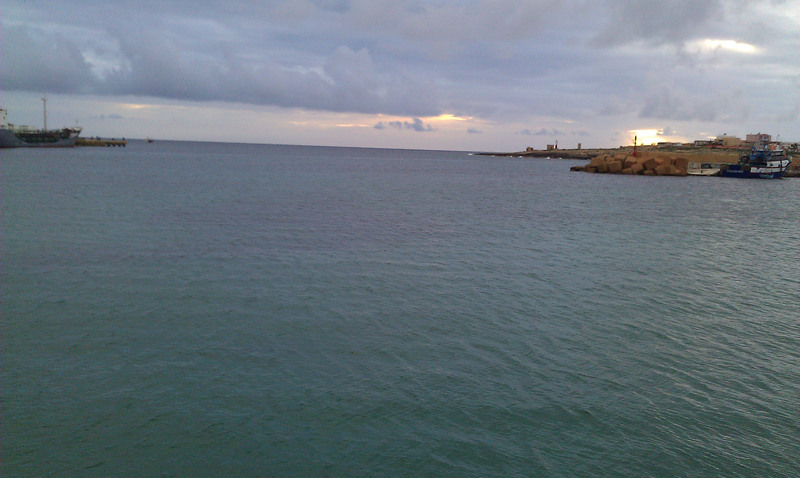 It was the third boatload of Tunisians to arrive in Lampedusa since Ben Ali’s fall. I hitched a ride to where the Italian coast guard were bundling the Tunisians into a small minibuses, but once again I came up against the militancy of European immigration management. I am told to leave the area where the men are being checked over because it is military restricted. Even before I left Lampedusa, when the number of refugee arrivals was less than a hundred rather than thousands, the island’s police struggled to cope. Determined to keep the reception centre closed, the coast guard shipped people immediately to Sicily by ferry or made them stay in local hotels. 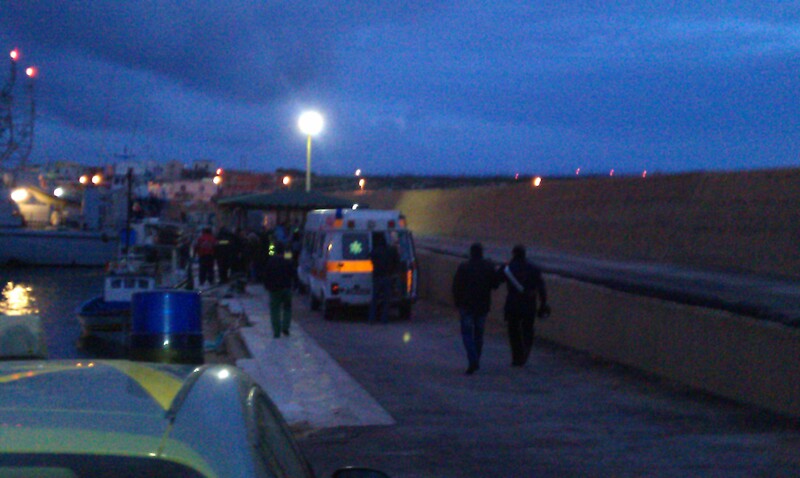 In the weeks following my visit, at least 5,000 Tunisian refugees have arrived in Lampedusa. A photo journalist I met on the island tells me that many are sleeping on the streets because there is nowhere for them to go. The day after the 32 Tunisian men arrive, I wait at Lampedusa’s tiny airport from where I’ve been told they will board a 7.30am flight to Palermo. The airport is small, almost claustrophobic, about the size of a corner shop. On one side are two check-in desks, on the other is a security barrier and a metre from that is the door leading to the plane. So when an officer from the Guardia di Financa (Italy’s coastguard) enters the airport, claps his hands three times and ushers in 32 Tunisians, everyone notices. Most of the men are quite young, in their late teens or early twenties. They carry their belongings in small plastic carrier bags. Two policemen herd them over to check in. They look exhausted, red eyed and hunched over; others appear relieved. The airport is silent as everyone gapes at the men in astonishment. The pilot says from Palermo, the refugees will be taken to a reception centre in Porto Empedocle, Sicily. It’s the first time in all his years flying to and from the tiny island that he has carried ‘boat people’ (as the islanders call them), he adds. Under the surly gaze of the guards, I try to speak to one of the Tunisian men. 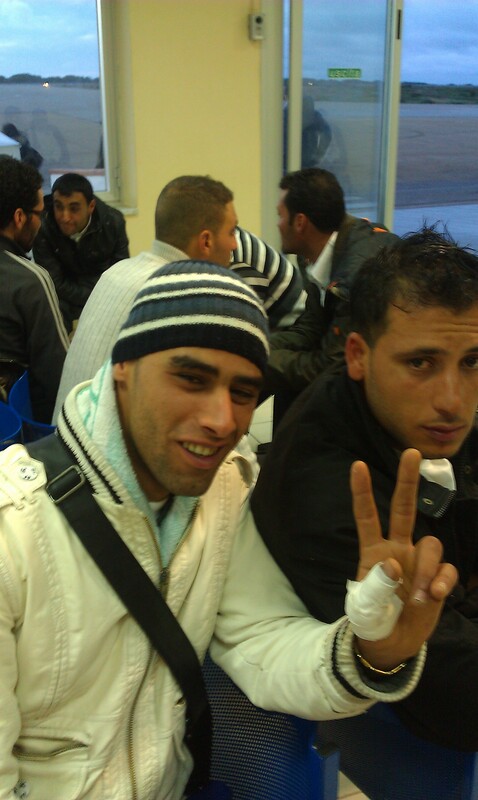 He explains that he and his friends left Tunisia because “the police are violent”. I approached him because I thought he looked less stricken than some of the other men, but the relief I thought I saw in his face was not there. He left his country partly because of the fallout from Ben Ali’s departure, but also because there is simply no work. The revolution hasn’t changed that, of course. I am not happy, he says, my family are in Tunisia. The general view among the men is that they will work in Italy. Under Ben Ali it was difficult for many Tunisians to leave the country and most couldn’t afford papers to do so legally. But, according to Mario, a Lampedusan resident, a lot of Tunisians have a rose-tinted view of Italy. When he last visited Tunisia, he was surprised to discover the dominant presence of Italian culture, such as Italian TV Channels and shops. Like many Italians themselves, he says, Tunisians have been fed a false image of Italy. As much as I sympathize with their plight it always strikes me as odd that if it’s so dangerous, where are the women and children? I put that question to many of the people I interview. It depends on the country and what they are fleeing from. There are many women and children who make the journey from Afghanistan and parts of Africa. But I also spoke to a guy from Somalia who said he planned to work in Europe and send money home to his family. In case the Tunisians, most of the ones I saw were young men…so they are less likely to have settled down and started a family. But you have a point…there will be a lot of women and children left behind suffering.